Home » blog » What Is Jade Rice and How Is It Used? Jade Rice is a visually appealing rice with a vibrant green colour that accompanies its sweet aroma. It looks great when served on its own or it can be used in a dish to create an appealing appearance. As an added bonus, this type of rice is just as healthy and as tasty as it is beautiful. Jade Rice has been infused with bamboo extract and is available in both short and medium grain varieties. When it is cooked it becomes sticky and moist while maintaining an alluring light green hue. While it is being cooked, Jade Rice fills the room with an aroma of vanilla and bamboo. It takes approximately 20 minutes to cook it to its full potential. 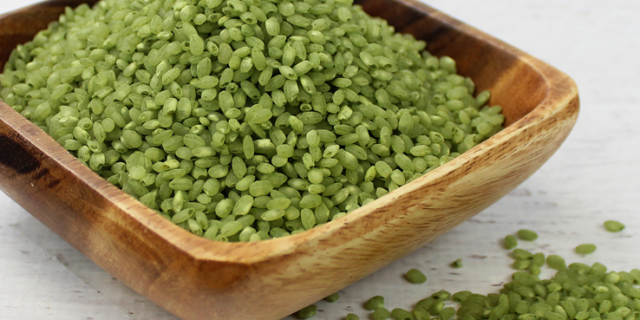 The rice is nutritionally dense and provides a high amount of protein, fiber and chlorophyll. The stems and leaves of the bamboo plant are juiced to retain the chlorophyll and then this extract is added to the rice during the milling process. This is what gives the rice the extra nutritional value and its gorgeous jade green colour. Our jade rice makes an exquisite plate presentation for dishes such as an Asian risotto, sushi, rice pudding, stir-fry recipes, soups and rice balls. It can also bring the presentation of a meal up to the next level by adding it as a side dish beside anything else. You’ll love the texture, aroma, flavour and visual appeal of this rice and you’ll find that it can be incorporated into many other recipes that call for plain white rice. Find out how you can order bulk quantities of jade rice directly from our distributor by visiting our website at Epigrain.com. We offer a discount pricing program for clients that place large orders and we are able to deliver your order directly to your restaurant or dining establishment. Epigrain is where to buy wholesale organic grains in bulk.